The other day, we covered painting your HQ. Today, we should back up a bit and cover the modeling aspect since you have to build your model before you can paint it. Following along in the same lines as before, the question becomes have I modeled my HQ wrong or have I done it in such a way that it's not the "best?" Not unless you've given him a weapon he clearly can't have or something along those lines and even then, you may have some leeway depending on who you're playing against. Since we know that how you paint your HQ will affect how he is perceived, we should also add that how he is modeled will do the same thing. This is my favorite. I do this all the time. 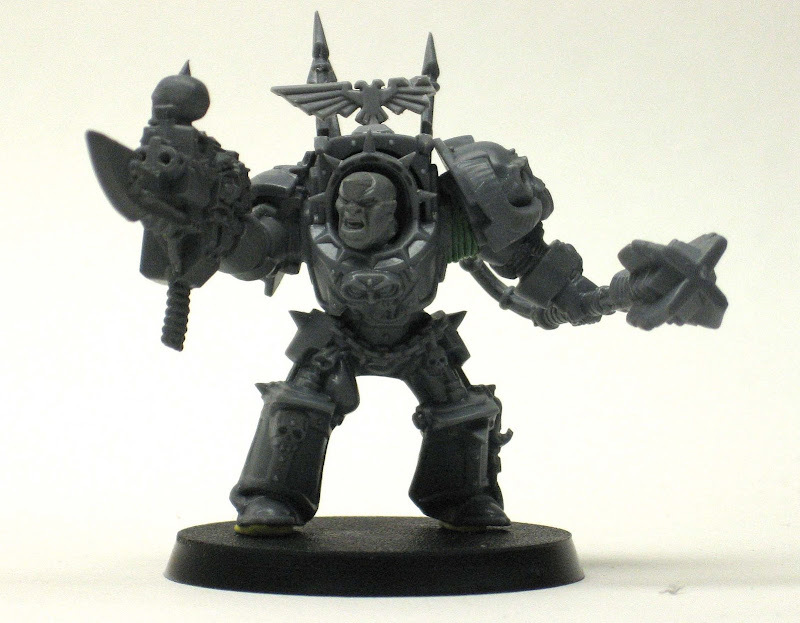 In fact, I took my HQ, the very one seen up top and ripped him off that base to put him on a bigger one later on. I wanted him to stand out even more. Did it affect his Strength or Initiative? Nope. Did it make my opponent look at him differently? I think so. By modeling your HQ to seem bigger than he really is, you're doing the same thing creatures in nature do all the time when it comes to fighting. They posture to make themselves look more dangerous and seem more deadly to their opponents. There are times when just looking tough can be enough to save you from getting in over your head. If your opponent looks at your HQ and sees some ornate armoured model standing on a rock outcropping with a huge banner depicting his many wins with tons of skulls at the base of his feet... he may decide the bottom of turn five is not the time to see just what your guy is made of. He might know exactly what the model is and still decide that it's not worth it in the end. I do it all the time. I may know that one particular Tyranid model is important, but after looking at how many claws it has and how long it's tail is... you know what, forget it, I'll just go around it and leave it alone. The downside to standing out among the crowd. They say the squeaky wheel gets the oil. If I look across the table and all of your models are two inches tall except for one single model that stands over 6 inches tall... I'd like to know just what that one does. If you make your HQ larger than life, it can be hard to hide on the battlefield. If you're comfortable knowing that you can't really hide anywhere (except maybe inside a vehicle), then go with it. Are you going to draw attention and lots of firepower? You most certainly are. If you're prepared for it though and you know that it's going to happen, then you can deal with it. Sometimes you want to announce to the enemy where you're at. When you have the ability to deal with whatever comes your way when you do, it's not a problem. But what if you can't deal with all of it? The other route is to model your HQ to blend in with your rank and file guys. Maybe you add a small element to him so he's different, but at first glance, he's nothing more than a regular Joe on the battlefield. This guy is the perfect example. 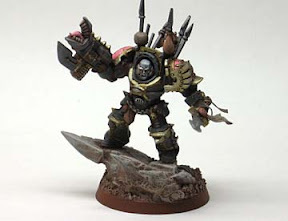 The only thing that sets him apart from all the other models in the army is the Imperial icon on the top of his armour. He's the only one in the whole force to have anything "Imperial" on him. It's enough to set him apart, but not too much. Just like before, this doesn't change his stats, but can give an uncareful opponent a false sense of security. I've actually always wanted to do this with my Deathwing army. Have a Librarian dressed in no armour, but just some ceremonial robes. 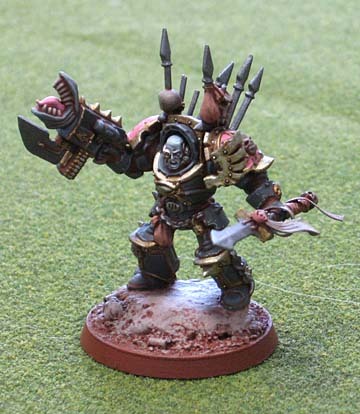 He'd be painted the part of course, but he'd be much smaller than all the Terminators around him. Truth be told, those are the models I look out for the most. Find the smallest guy in the Imperial Guard Command squad and avoid him at all costs. He's the one that can demolish a tank with his pinky. Thanks, I'll skip fighting that guy for now. If you come across an enemy model with no weapons at all in his hands, it should be a red flag. Maybe he can't do anything... and maybe he can do it all. There is a downside to modeling your HQ smaller or less obvious than usual. You can't really puff him up and make him look tough. Sure he blends in and you can use that to your advantage, but you won't be convincing anyone to stay away based on your looks alone. They both affect how your opponent views your HQ and army. I'd say go with the one you like more. If you like the idea of a regular, unassuming Commander, then go with it. If you like the power armoured model scaled up to a 60mm mini-diorama base, then go with that. Just know that either route you chose, you'll get the associated effects. Maybe you'll end up drawing more firepower that warranted and dying in the first turn in 9 out of 10 games. And maybe you'll have to remind yourself that you did field a Commander after each game and try not to keep putting him back in the case mixed in with a Tactical Squad. Seriously, really like this set of articles- out of interest, are you doing the same visual mis-representation with all of the units in your army, or just the HQ? Tenzing: Thanks. With a "counts as" army like this... all of the units "represent" something else. Even though the units are different, I've clearly identified what weapons are what throughout the army and have made a conscious effort to remain consistent. For example, if Squad A had a heavy flamer and Squad C had one as well, both heavy flamers would be modeled the same way so that my opponent would be able to identify all of the heavy flamers as being the same. The idea is not to trick your opponent, but to be consistent in your modeling and know that how you model your HQ can have an impact on both how he is perceived and how he is used on the table. I've been thinking about this a lot since I saw your original post on Jawaball's blog. I play a Blood Raven's Themed Blood Angels army. ...Okay so maybe the third isn't really "raveny" but I loved the look. With these differences I've been told it can be a system shock to another player since most Blood Raven players regular SM. On note with customizing your HQ's I'm really looking for Marine Head that can be a Librarian but is full helmed. Anyone know of one? ServvsUmbrarum: If you love the look of your army and you take the time to explain things to your opponent, there shouldn't be any issues at all. Just because you use a different Codex to represent your force doesn't mean it's wrong. 2nd row in the pic- set of heads, some bear, some helmeted, some hooded. I reckon the one on the far right is most suitable, but that's just me.